In NAV we have one company that has our logo on the Company Information card. This logo currently shows up on all of our sales invoices. We are working with another entity where on certain sales invoices we would like two logos (or a combined logo) to show up. We would still need to put the single logo on invoices as well. Does NAV have this capability to use two logos in one company where you would select one vs. the other based on the customer? You did not indicate which version of NAV you are currently using. In the newer versions, you can assign different document formats based on customer. For example, quotes, order confirmations, and invoices, can have unique reports/formats by customer. Create a custom version of your invoice adding the additional logo. From the Customer Card, go to Document Layout and assign this custom invoice's Report ID for Invoice Usage on the customers that need the "combined" logo. All others would use what is indicated in Sales Report Selections for the invoice. Hope you find this answer helpful! ​We are using NAV 2013R2. I tried looking for Document Layout and am not seeing it. Do you know if our version is too old? Just did a quick check, it looks like it was added in NAV2016 - bummer! Maybe another benefit to upgrade? ​Thanks for the help Cynthia! Are you using a different Responsibility Center for each entity? We have several sales divisions and the logo that appears on each invoice is driven from the Responsibility Center picture associated with that invoice's Sales Division. It would help if I told you that it is Document Layouts found from the NAVIGATE Ribbon, Customer group box on the Customer Card where you will find this setup. The way we have handled this (and we have since 2009 Classic) is to run some code on the reports (invoice, credit memo, ect) to show or hide the logo image based on whatever criteria we want. We have our default company logo set as company picture and embed the other logos in the report. We stack them all at the same location and just show or hide them as needed. So yes, its doable if you are a report designer. We have added a custom table which contains all the variable information on an invoice or other documents. In each report we call a function to determine which record number we have to use from the custom table to print a this specific invoice. Costcenter/Website are whatever is needed to change on the layout. In the same table we have also the information which we have to print as a footer on the invoice. You can set a specific Logo up on it, a second trade style name, separate Phone Numbers, Fax numbers, and Email contact info, and a web home page. You can assign the responsibility center at the Customer Card level or in the General Tab of a sales order. Charge Logic and Lanham Eship licenses. If you want to give visibility to additional Trade Style Operating Departments in your company it is an option. You don't have to do any custom programming. If you need the entities to operate under separate FEIN numbers, you probably don't want to use it. What version of NAV are you using? And what drives the difference between the two logos? 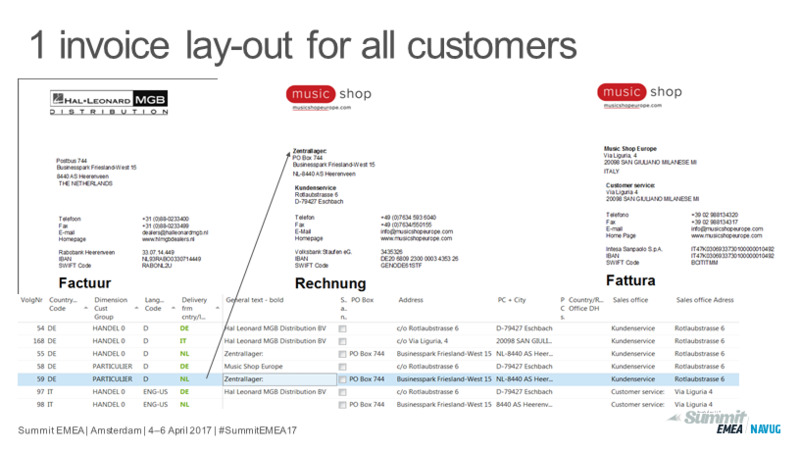 In the newer versions of NAV, you can define a document layout by customer on the customer card. Responsibility centers are a way to accomplish this, but it can also cause some pains since it really restricts user access. We saved the Logo image related to the Trade Style Name to it's respective responsibility center. The environmental equipment was still promoted by the Parent company and was absorbed into the parent. The responsibility center allowed continuity and visibility to the old Trade Style, and allowed consolidation of all ERP functions to one company setup on Navision. All staff had full access under both responsibility centers.